Ford has followed up its recent introduction of the third generation SYNC infotainment system with the announcement that it will come standard on all 2017 models and will include both Apple CarPlay and Android Auto smartphone connectivity. SYNC 3’s introduction on later 2016 Ford models and all 2017 models, starting with the new 2017 Ford Escape, finally answers the company’s promise to bring better smartphone connectivity and technology to its lineup, this time teaming up with Blackberry instead of Microsoft. The new infotainment system will come standard with Ford apps, including a Siri Eyes-Free app separate from Apple CarPlay that will allow drivers to navigate the system with voice commands, as well as new SYNC Connect phone connectivity that promises to allow owners the ability to remote-start the vehicle, unlock doors, locate the parked vehicle, and even display fuel levels via the phone app. In-car phone connectivity through Apple CarPlay or Android Auto will also allow drivers to use Apple Maps or Google Maps via the vehicle’s navigation, as well as stream music and make phone calls. The biggest updates with Ford’s SYNC 3 include a completely redesigned system with new Ford AppLink apps to be detailed at the automaker’s CES event this week, as well as WiFi connectivity which will allow for the car to automatically update from the garage or driveway when linked with a wireless home network. Any current 2016 models with SYNC 3 do not include Apple or Android’s systems, nor Ford’s updates, but the company promises there will be a free system update later in the year for the new features. 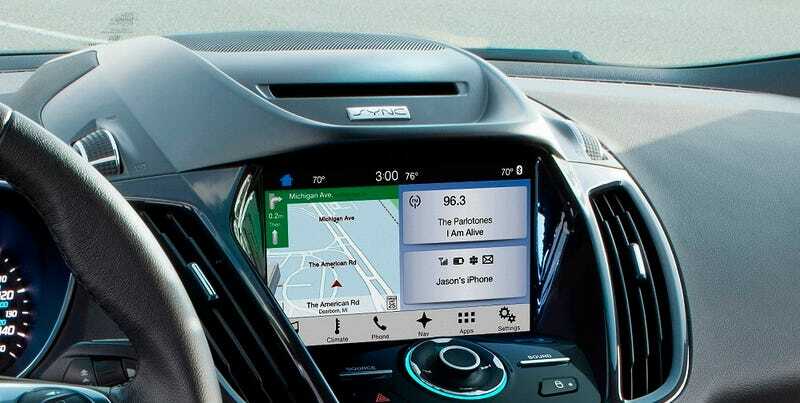 Going forward, Ford owners will now have the option of using Apple CarPlay, Android Auto, or the automaker’s rebooted AppLink system for hands-free interaction in the vehicle, making SYNC 3 the biggest improvement to Ford’s infotainment technology yet. Of course that’s only if there’s hardware to back it up, and if people like my grandparents are able to figure it out, AND if SYNC stops being a total narc and calling the cops on everybody. You can check out the full press release over on AutoBlog.